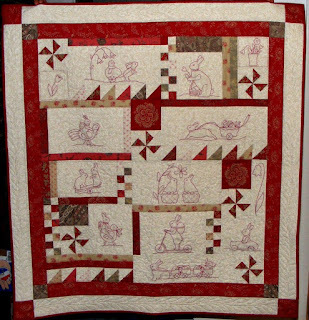 Quilting Adventures: A tad late......! How's the weather in you neck of the woods? Goodness, Mother Earth has been quite active this year! I do hope that this blog entry finds you all safe and healthy! The pattern is called Rabbits Prefer Embroidery by Bunny Hill designs. Once again, I use the Moda French General line called Rouinerie! I do like that line. The reds are so sweet. Thank you so much for stopping by! Enjoy the moment! Cheers! 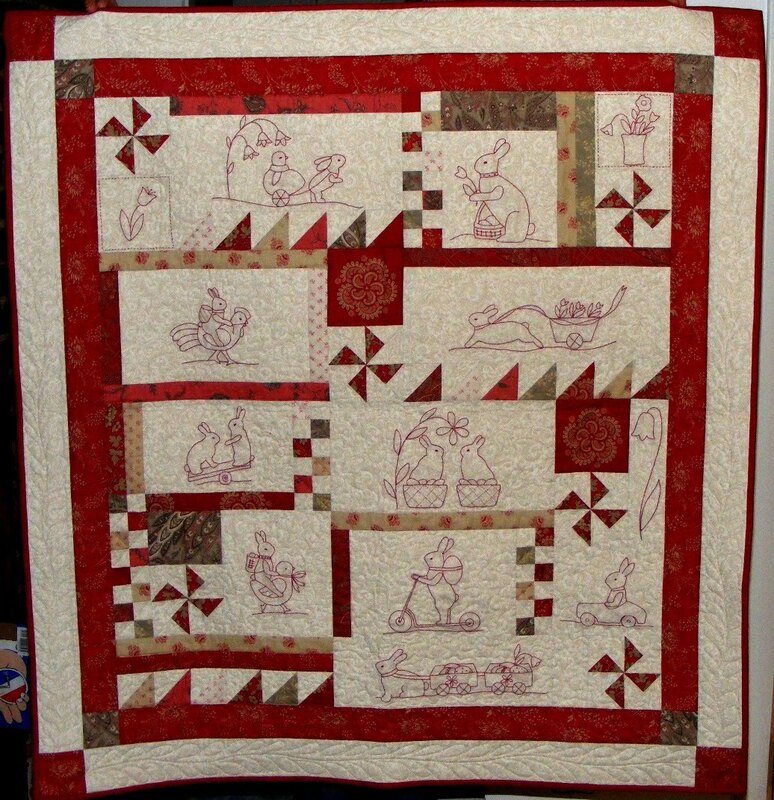 This is a beautiful and very classy looking quilt. Love the stitchery blocks and the gorgeous fabric you chose! Carole- This is stunning! The picture just doesn't do it justice, it is so beautiful . Thanks for hosting our circle of friends gathering today, it was wonderful stitching with you and as always the time flew! Very cute! And your post title is all wrong -- it should be "Almost a Year Early"!!! Beautiful quilt. Those reds are great. Bunny hill bunnies are the best. More Civil War stuff .....! Things that make you go haaaaaaaw...! Things have settled a bit....! A tribute to a dear friend...!